Evangelists of Pattern Based Strategy focus on Pattern Detection technologies and say little of the mechanics behind determination of area of focus, content and event sources, reaction to detected patterns (be they weak or strong) and reaction to contradiction. The ‘three cog model’ in Figure 1 aims to address these deficiencies. 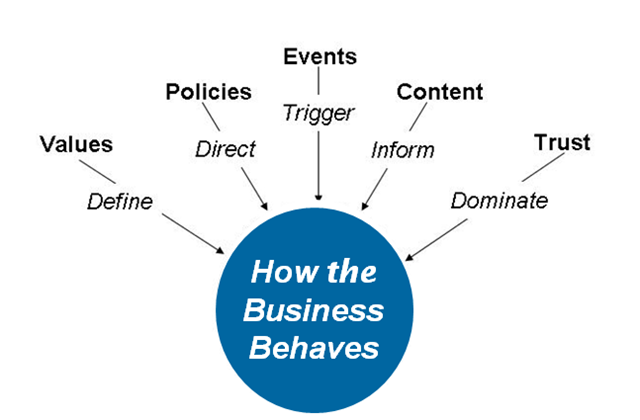 PEST Analysis is suggested as a strategic thinking framework to focus on Political, Economic, Social and Technological forces (be they opportunities or threats). 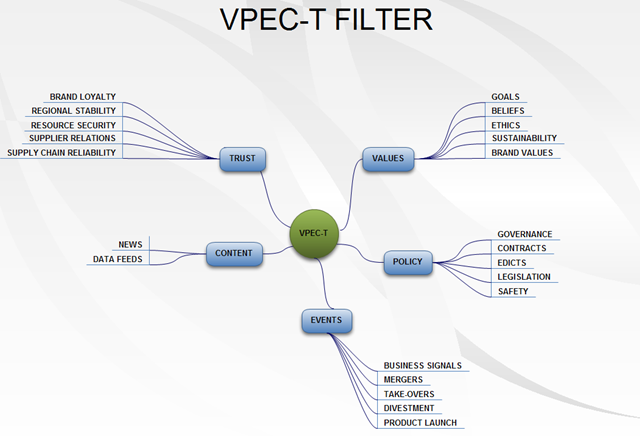 To help reduce complexity and filter irrelevant forces, a VPEC-T frame (Figure 3) surrounds the PEST analysis activity. VPEC-T (by Carl Bate and Nigel Green) in this context is a useful frame with which to surround PEST analysis to ensure focus and filtering of candidate hypotheses. The first step is to populate a VPEC-T filter, such as that (somewhat simplistically) pictured in Figure 3. Recognising that some analysts extend PEST to PESTEL (including Environmental and Legal forces) the VPEC-T filter includes legal considerations under the Policy dimension and environmental considerations under the Values dimension (in the guise of sustainability). This feeds into a Scenario Planning cog described later. 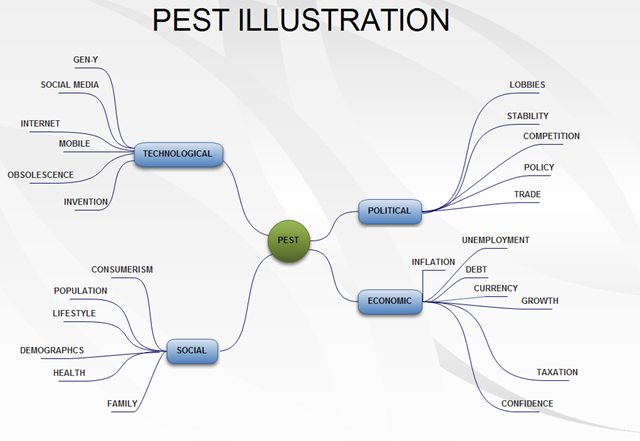 PEST analysis stands for “Political, Economic, Social, and Technological analysis” and describes a framework of macro-environmental factors used in the environmental scanning component of strategic management. 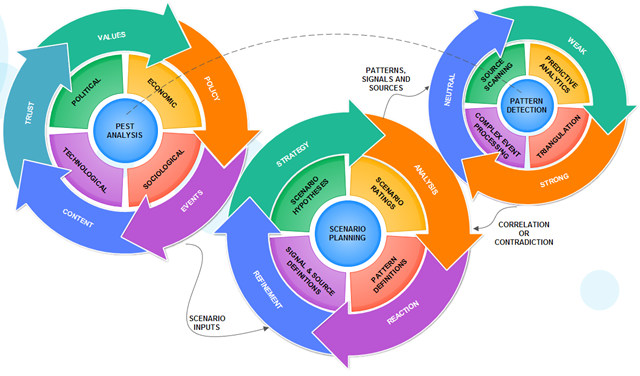 Scenario planning, also called scenario thinking or scenario analysis, is a strategic planning method that some organizations use to make flexible long-term plans. It is in large part an adaptation and generalization of classic methods used by military intelligence. Exiting this cog we have a strong definition of ‘patterns to seek’, why (based on Scenario Planning), how we will react if the pattern is detected, the signals that will indicate detection of the pattern and the information sources to monitor for those signals. The Pattern Detection cog now has an important technical role in correlation or contradiction. Having systematically defined the patterns, related signals and information sources, the algorithmic wizardry of predictive analytics and complex event processing take over. Not to downplay the complexity of scanning significant volumes of real-time, unstructured data and combining data sets in new ways to look for patterns, this area of Pattern Based Strategy is much more widely represented. I like the idea of triangulation as a means of signal reinforcement, however the strategist must also understand the need for tolerances. For example, reacting to a weak signal in a scenario with potentially disastrous outcomes requires quick intervention. In other cases a ‘wait and see’ approach may be more suitable. This level of sophistication needs to be considered to ensure the right reaction at the right time. The window of strategic advantage may be very small. My hypothesis is that the Pattern Detection cog also creates an elegant feedback loop to the PEST cog. It is purely theorising, but it seems highly plausible that developing deeper understanding of scenarios, patterns and signals will sharpen the PEST analysis and VPEC-T filtering leading to increasingly sophisticated results.